Machine safety is critical to the deployment of a machine vision system. We stock a range of products to enable you to employ the safest environment in your application. 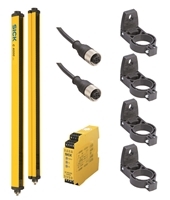 Our range of machine safety products include control modules, safety barriers, safety camera systems, safety laser scanners, safety switches and touch buttons from the biggest manufacturers in Europe.